I splurged last week and bought kits from Fabric Depot and Connecting Threads. The kits from Connecting Threads arrived on Tuesday. I should have been cleaning house but the lovely fabric was too tempting. I made up one of the pillowcases. The fabric is just wonderful!! It is going to be hard to be satisfied with fabric from the local chain store! The pillowcase is from the Backyard Friends kit and it is pictured with some pins that I wore in the '60's and a mug a friend gave me in college. Connecting Threads sent enough that I could interchange the brown with the lime green. The green is now the narrow trim for both versions and I have a pillowcase reminiscent of my favorite colors in high school along with my favorite flower. I think this is going to be mine. I am always giving away the pillowcases that I make but not this one. 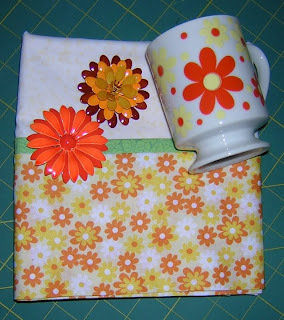 If you are looking for instructions for the pillowcase, you will find a great tutorial for the same method in the Connecting Threads kit at With Heart and Hands. It is known as the magic or burrito style/technique. The seam for the band and accent strip are encased inside the band and then French seams are use to finish the rest. If you don't have a serger or just like professional looking construction methods, this is for you. The band is cut 1/4 yard wide, the narrow trim is 1.5 inches wide, and the main body of the pillow case is 3/4 yard. I used 1/8 seams inside the French seams and 1/4 inch to encase them. Also, the seam allowance inside the band is 1/4 inch. I like to attach my narrow trim to the front side of the main body with a 1/8 inch seam first, then I fold the band to quarter mark it. I use the quarter marks to match the band when I attach it to the body with the attached narrow trim. Matching the quarter folds and pinning carefully prevents ripples and shifting. Instructions for a pillowcase with serger finished seams can be found in the Tutorial Links in the right side bar of this blog. Have fun sewing and remember, pillowcases don't have to match your sheets. Make them for holidays, in honor of personal special occasions, and change them to suit your whims.